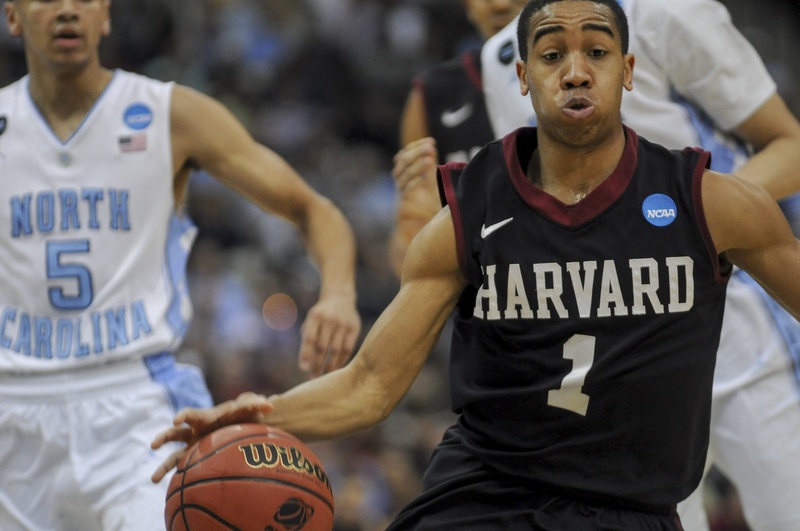 Despite Crimson senior wing Wesley Saunders's 26 points on 8-for-14 shooting, Harvard fell to North Carolina, 67-65. UPDATED: March 19, 2015, 10:24 p.m.
JACKSONVILLE, Fla.—With 1:20 left in the game and his Harvard men’s basketball team trailing by two, Siyani Chambers truly typified the ‘madness’ so inherent to the NCAA Tournament. Chambers held the ball behind the three-point line, waiting for senior wing Wesley Saunders to shake his Tar Heel defender and get open. With the clock ticking down to single digits, Chambers had no choice but to make a play himself. He dribbled to the top of the key and pulled up, a foot behind the line. The shot was in the air as Chambers fell to the floor, and it sliced through the net as the referee’s whistle blew. Moments later, Chambers had sunk the free throw, completing the four-point play and giving the Crimson (22-8, 11-3 Ivy) its first lead of the evening. What was a 16-point deficit was now a two-point advantage—and Harvard was only 1:15 away from advancing to the round of 32. Senior wing Wesley Saunders recorded 26 points, four rebounds, and five assists in his final game as a member of the Crimson. But a runner near the left elbow from North Carolina freshman Justin Jackson, followed by the rookie’s transition slam 25 seconds later gave the advantage, and the game, back to the favorites. As a desperation three-pointer from Saunders with one second left ricocheted off the rim, the score went final. Despite a game-high 26 points from Saunders, his Crimson fell, 67-65, to the No. 4-seeded Tar Heels (25-11, 11-7 ACC) Thursday evening in its second-round matchup at Veterans Memorial Arena. Harvard’s comeback effort began at the 14:16 mark of the second period when, down 52-36, senior forward Jonah Travis hit a pair of free throws. North Carolina wouldn’t score for almost four minutes—until just 11:27 remained—giving the Crimson time to inch back into the contest. After a Tar Heel turnover on the next play, Saunders skipped a pass to sophomore Corbin Miller in the left corner. The marksman hit his first triple of the game just moments before senior forward Jonah Travis drew a charge on the other end. Harvard would go on to score 14 points in the next 5:40 of play, holding North Carolina to six in the same span. And when Chambers found Saunders in the left short corner with just three on the shot clock plays later—and Saunders promptly sunk the jumper to bring the Crimson within two—all was set up for Chambers’s straightaway, last-second triple on Harvard’s next possession, with the Crimson playing Cinderella once more, now up two with 1:15 to go. Junior guard Siyani Chambers had a key four-point play with just under 80 seconds remaining in the contest that put the Crimson up two—it's first lead of the game. But the Crimson’s lead was short-lived. When the Tar Heels brought the ball down the floor after Chambers’s four-point play, junior J.P. Tokoto sent it to Jackson on the left wing. Jackson connected on a shot from about 15 feet out, tying the game at 65 apiece. 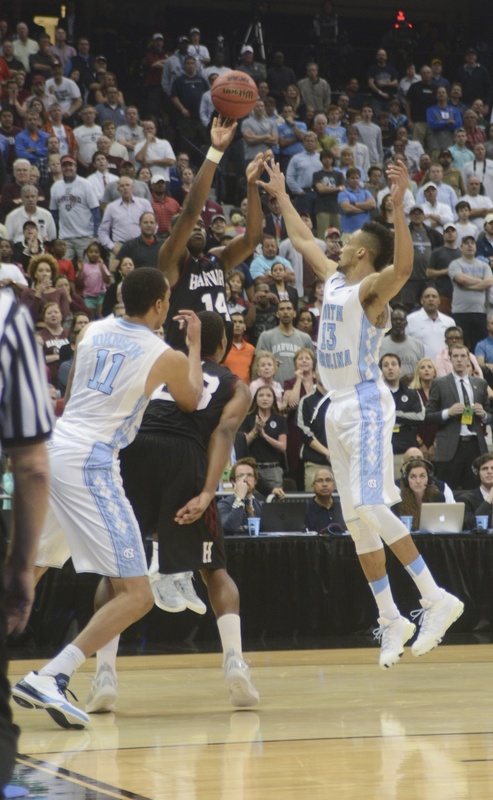 From there, North Carolina’s defensive pressure stifled the Crimson. Chambers was forced to put up a contested three-pointer with the clock running down, before Tokoto grabbed the board and sent it ahead to point guard Marcus Paige. Paige found Jackson on the left block, who slammed the ball into the hoop before Harvard could get back. Then, with just 11 seconds remaining, a missed shot from Chambers led to an over-the-back foul called on Travis. The Tar Heels missed the front end of its one-and-one, however, and Harvard grabbed the rebound. After climbing all the way back into the contest, Harvard now had just about 10 seconds to fight its way back once more. At the end of a broken play, Saunders heaved up that deep, ricocheting three just before moments before the final horn sounded, seemingly the first shot all game that the senior could not get to fall. Co-captain Steve Moundou-Missi had six points and five rebounds in 38 minutes of play in the loss. The skeleton of Thursday’s game—Harvard’s 16-point comeback, two-point advantage, and eventual loss—was a mirror image of the heartbreak that the Crimson suffered in the third round of last year’s March Madness, a game in which it fought back from an equal deficit—and gained that same lead—against eventual game-winner Michigan State. Saunders was visibly moved when he took the podium after the contest. In the last game of his collegiate career, the former Ivy League Player of the Year reached the 1500-point plateau and nearly willed Harvard to victory with his 26-point, 8-of-14 from-the-field performance. It was he who provided the offense in the early going when no other Crimson could connect—scoring or assisting on every basket in the first half—and it was he who found ways to score, despite a swarming defense, in the game’s waning minutes. Harvard junior point guard Siyani Chambers had a key four-point play late in the second half that gave the Crimson its first—and only—lead of the game. Chambers finished with 13 points on 5-for-13 shooting from the field. So while the players spoke of the pain of the loss immediately following the game, Thursday’s fight against North Carolina was also indicative of the place to which this senior class has brought Harvard hoops. Not only did the Crimson come back against one of the most storied schools in collegiate basketball, but not many were surprised when it did so, basket by basket slicing into the Tar Heels’ lead. For these seniors, then, it was only appropriate to end their time on the collegiate hardwood in such a fashion—in a game that showcased just how far the Harvard basketball program has come. —Staff writer Juliet Spies-Gans can be reached at juliet.spies-gans@thecrimson.com.